Contains ONE months supply - (90 capsules). 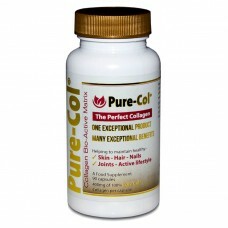 Each capsule contains 400mg of pure collagen. Take 3 capsules with water at least 2 hours after eating and just before going to sleep. Drink 6-8 glasses of water daily. With ageing, and as a result of exposure to the sun, collagen fibre components begin to weaken, become less pliable and tougher. The result is the development of dry, wrinkled skin that has lost its inherent elasticity. PURE-COL may arrest and reverse this condition. In the first 45-90 minutes of sleep your body goes into alpha sleep mode. At this stage the body goes into a repair and rebuild or "rejuvenation" mode. As we grow older this process slows down. Our bodies no longer function as we were when younger to produce the collagen or amino acids required to keep our skin looking radiant or our bodies tight and strong. This special collagen supplement is a natural source of absorbable collagen protein that can feed the body during sleep. It is formulated with pure collagen. This special formula allows the protein to be bio-available, ready to assist the body in the production of good tissue.